The University of Louisville Alumni Magazine: for alumni, faculty, staff, students and anyone that is a UofL Cardinal fan. 3 0 | L O U I S V I L L E . E D U ABCDEFGHIJKLMN OPQRSTUVWXYZ abcdefghijklmnop qrstuvwxyz 1234567890&@$% Maxular Model B is the font used for headline. At the time, a few fonts designed specifi cally for people with vision problems did exist, yet Kleespies did not fi nd them helpful. "Almost all low-vision publications are printed in sans serif fonts," he said, "which are absolutely the worst for legibility." Serif fonts include small lines or fl ourishes at the ends of letters and symbols. Sans serif fonts do not have these additions, making the letters simple and clean. So standard designer rules would suggest that stick fi gure-looking sans serif fonts, like Courier or Arial, would help Kleespies recognize each letter easier. "But the sharp angles actually became distorted, slowing his progress," said Skaggs. For Kleespies, a popular typeface from the 1970s — called American Typewriter — had actually proven to be the most effective font for helping him read. 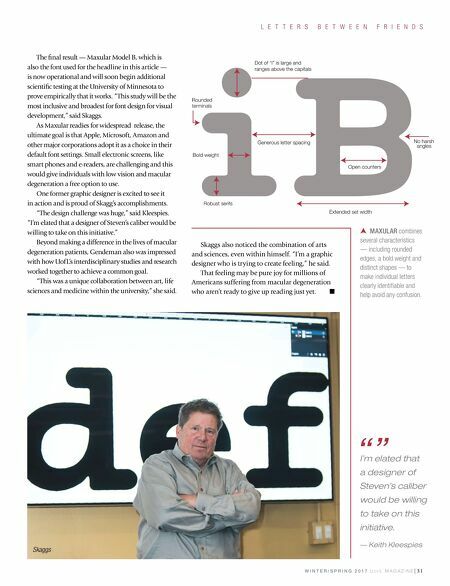 So Skaggs took what he had learned from his conversations with Kleespies and began designing a specifi c macular degeneration typeface. Of course, to be truly effective, it had to be equally readable for people with low vision as well as those with normal vision. The font — initially known as Maxular Model A — utilized rounded edges and a bold weight. Each letter would be distinct to avoid confusion between characters that may appear very similar. And spacing needed to be balanced, ensuring that individual letters could be clearly identifi able yet also kept close enough together to be recognized as words. Throughout the process, Skaggs and Kleespies would meet at the Bambi Bar on Bardstown Road to test different sketches over burgers and beers. Kleespies' graphic design background and love for typography proved invaluable as he was able to communicate technical changes with Skaggs to help Maxular continue to evolve. Once Skaggs had a working prototype, the next step took place in a more scientifi c environment. Jennifer Gendeman, an occupational therapist in UofL's Department of Ophthalmology & Visual Sciences at Kentucky Lions Eye Center, led the fi rst clinical trials. 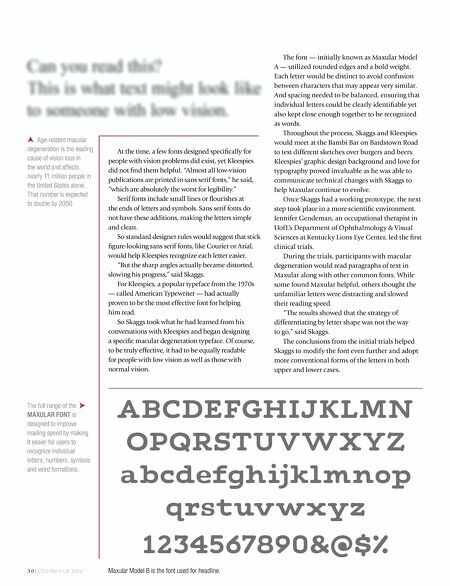 During the trials, participants with macular degeneration would read paragraphs of text in Maxular along with other common fonts. While some found Maxular helpful, others thought the unfamiliar letters were distracting and slowed their reading speed. "The results showed that the strategy of differentiating by letter shape was not the way to go," said Skaggs. The conclusions from the initial trials helped Skaggs to modify the font even further and adopt more conventional forms of the letters in both upper and lower cases. Age-related macular degeneration is the leading cause of vision loss in the world and affects nearly 11 million people in the United States alone. That number is expected to double by 2050. The full range of the MAXULAR FONT is designed to improve reading speed by making it easier for users to recognize individual letters, numbers, symbols and word formations.